Upholstered & Leather Sofa Steam, Dry Cleaning Allerton L18 | Quality Property Care Ltd.
Do not hesitate to give us a call and make a reservation or ask for more information about our expert upholstery cleaning services in Allerton L18. Dial this phone 0151 673 0008 and reach our polite and kind customer support representatives. They respond to customers service support and will arrange a visitation by the skillful and professional sofa cleaners for you as soon as possible! Please note that if you order more than 1 service, you will get a special discount from us! All regular and loyal customers also receive a promotional price! If you order upholstery cleaning in Allerton L18 from Quality Property Care Ltd. and another service you will receive a special discount. We recommend you take benefits of bed bug mattress + mattress cleaning. Your bed hygiene is as important as your home sofa cleanliness and perfect look. The mattress procedure destroys and removes dust mites, fungal spores, bacteria and other harmful debris. It works with intensity ultra-violet light, and all dust and debris are gone. Be sure that we remove dust allergies for healthy measure of safety, because it can cause runny nose, asthma, depression, itchy eyes, headaches and eczema. Mattress cleaning offer is suitable for hotels, hostels, hospitals and everything that has beds. 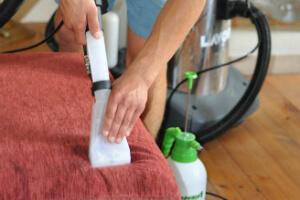 Unlike most professional upholstery cleaning companies, Quality Property Care Ltd. has developed two unique formulas. They are upholstery cleaning services inAllerton L18 that are devoted to the high-class leather sofas and the delicate suede sofa cleaning. For leather cleaning we offer crack filler with different colours, mat leather, leather rejuvenator and foam leather cleaner. As to the suede upholstery, we can sanitize velvet, suede and other delicate materials. Here dry cleaning is used to protect the fibers from tearing and damaging. Our range of stain elimination capability matches our extensive experience in the filed, with available solutions for oily, grease and blood stains, food colouring, paint, animal fats, asphalt, nail polish, chewing gum, blood, tea, coffee, vomit and wine. Booking more than one cleaning service will bring you a very serious discount from the price. Just call our customer care service at 0151 673 0008 or use the Internet booking form, and you will be able to book one or more services right now. You can book your sofa upholstery cleaning service for weekends, or on bank holidays, and even for today! Call or send an online booking request to our friendly customer care service right away, and you will receive a written confirmation as soon as possible!